Sometimes a carport project comes along that is anything but regular and such was the case with this Melbourne carport, in the suburb Dandenong. The homeowners wanted to design and build a large, gable roof carport. On its own, this is certainly not an unusual or challenging request; the tricky aspect was where the carport needed to be placed. The family wanted the carport sandwiched between the house and the fence-line, an area that featured more angles than a jigsaw puzzle! 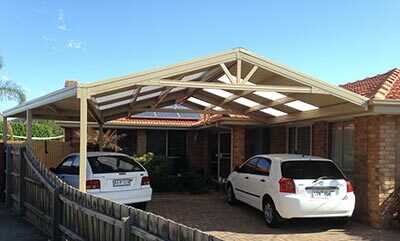 Not to be daunted, the Mr Carport Dandenong team designed a carport that provided the perfect solution. The design featured both a gable roof for the main part of the carport and a flat roof area on one side, providing more roof coverage and better protection from the elements for both man and machine. To build the Melbourne carport, a Firmlok steel frame was chosen, in a colour to match the Dandenong house. This was topped by Colorbond steel Trimdek roof sheets and several polycarbonate roof sheets to create a light-filled carport. Double-sided Colorbond sheets were chosen to ensure the structure would look great both inside and out the carport. The result is a stylish and spacious addition to the Melbourne house and a carport that is both practical and pleasing to the eye. Whether you have a simple or a challenging Melbourne carport in mind, phone Mr Carports on 1800 557 782 for a free design and quote. For more information on building carports, look at our Melbourne branch page or the Outside Concepts carports page. ‹ An Adelaide carport or entertainment area? Why not have both!